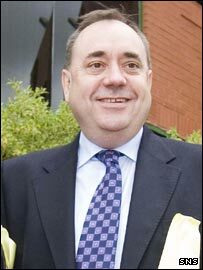 Alex Salmond says he would support a Scottish bid to host the European football championships in 2016. The new first minister believes that planning should start now and that any application should be a solo Scottish bid rather than a joint one. He told BBC Sportsound: "There's no reason why Scotland can't submit a bid and any preparations need to be made now - and a single bid would be best. "It's time Scotland got involved and clearly the SFA would play a key part." Scotland failed in a bid to host Euro 2008, which would have been held jointly with the Republic of Ireland, with the showpiece event going to Austria and Switzerland instead. Salmond attended the Uefa Cup final at Hampden Park between Sevilla and Espanyol and spoke to Uefa president Michel Platini. "I told him all about how good the atmosphere was at Hampden and he agreed," he added. "He knows all about the passion of Scottish football fans, even though he surprisingly never got to play for France at Hampden in his own career. "I will always be behind any Scottish sports side and hopefully Glasgow's bid to host the 2014 Commonwealth Games will be successful as well. "Sport in Scotland will be high on the agenda of the new Government." Should Scotland make a solo bid to host the Euro 2016 finals? Should Scotland bid for the 2016 European Championships?